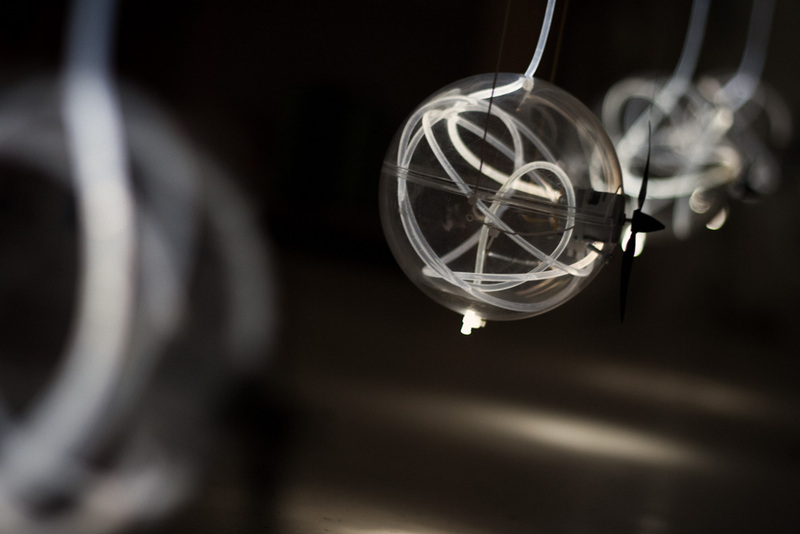 Kinetic Light & Sound Installation. 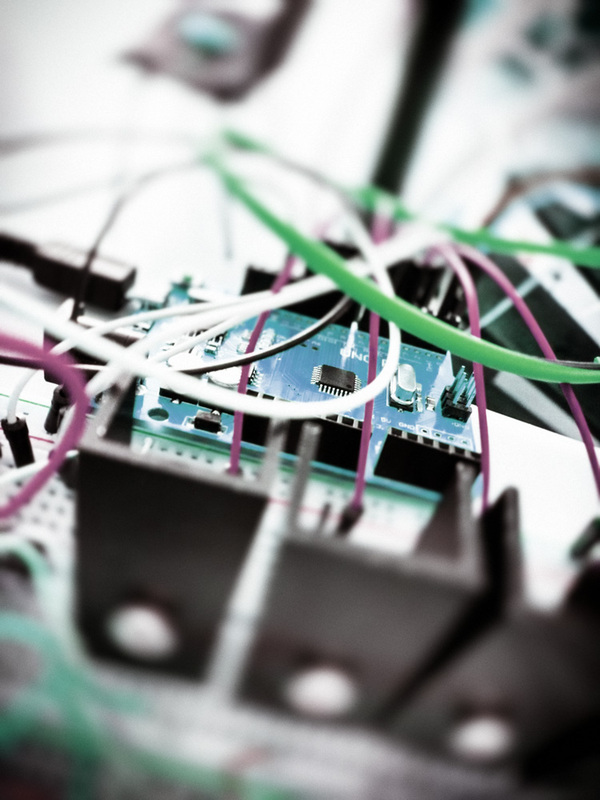 Optical fibres, LEDs, motors, arduino and custom software. 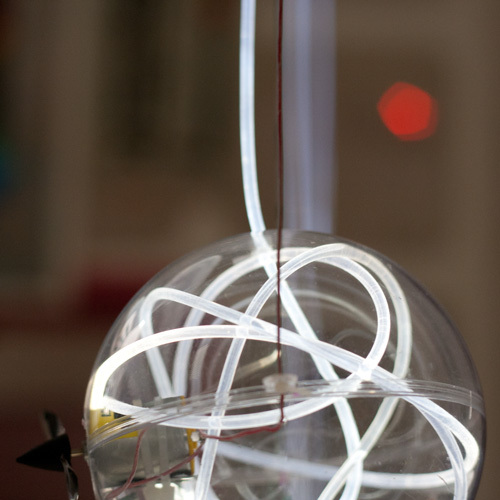 Pentatono is a kinetic light and sound sculpture, where harmony and periodicity are the fundamental elements. 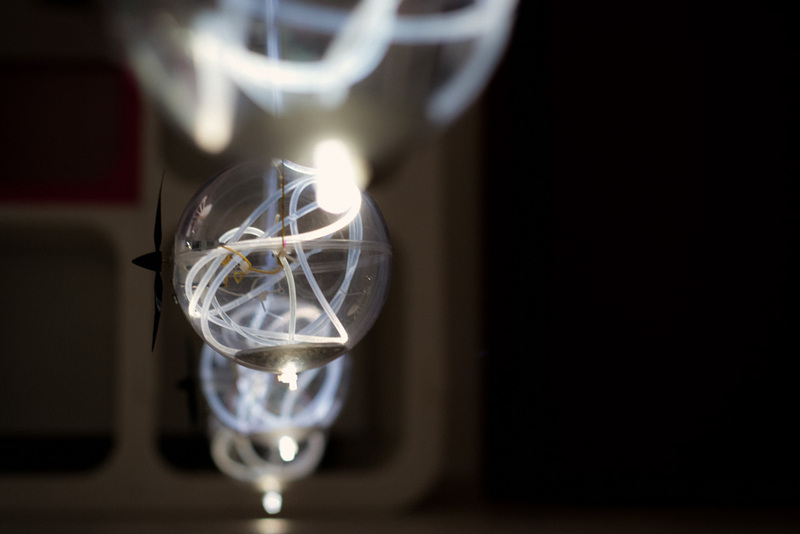 Motion, sound and light, all are obeying the laws of the harmonic oscillation. 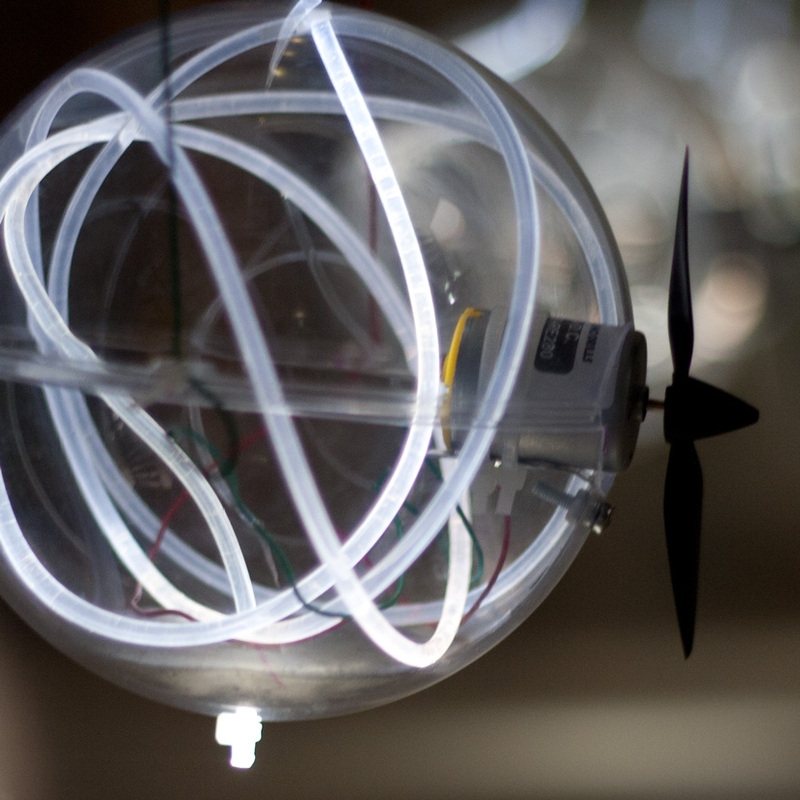 Five acrylic balls are hanging from optical fibers and form five pendulums that are moving in the space using the thrust of small propellers. When a pendulum passes from the equilibrium position (the middle of the motion path) it emits a light pulse and sound tone. 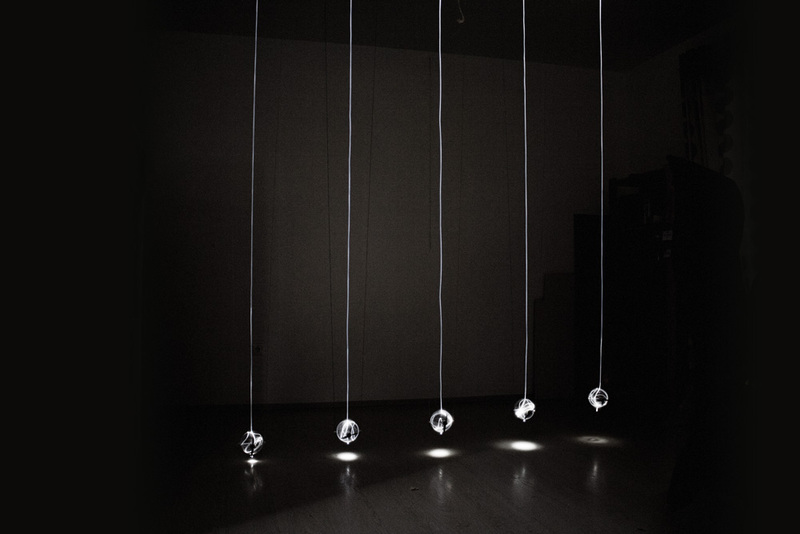 Each pendulum is “tuned” in a different note of a natural pentatonic scale. The lengths and hence the periods of the pendulums are accurately adjusted to form visual traveling waves, standing waves and quasi chaos. 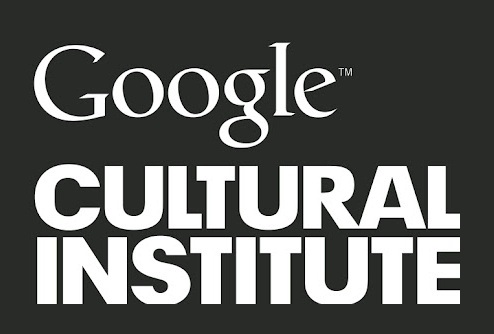 Presented at Google Cultural Institute Special Price of Kinetica Museum London. 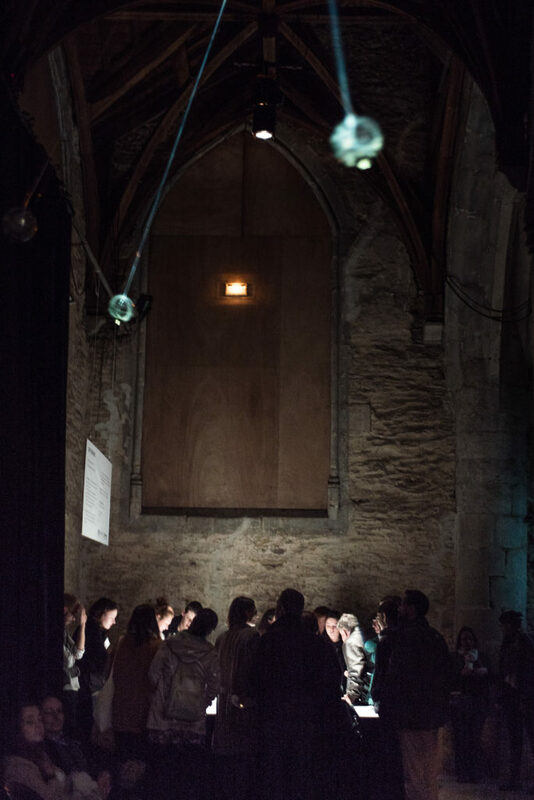 Selected for 2016 Aesthetica Art Prize Longlist. 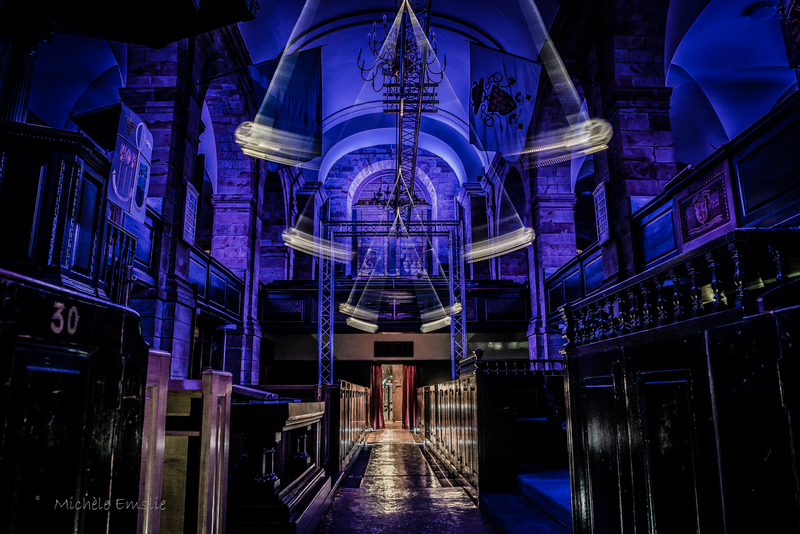 Pentatono at St. Nicolas Kirk, Aberdeen, UK for SPECTRA 2017 Light Festival. Photo by Michèle Emslie. Harmonic motion, a periodic movement between two points, occur widely in nature. A simple harmonic oscillator is used to model and explain many phenomena in both classical physics and quantum mechanics from modelling phonons to describing quantum fields. Beyond that, a vast amount of motions, sounds, and systems in general are analyzable as superpositions of simple harmonic motions of varying frequencies and amplitudes (Fourier analysis). The pendulum is a simple harmonic oscillator. The period of a pendulum (T) depends on its length: where L is the length of the pendulum and g is the local acceleration of gravity. We have chosen different lengths for the pendulums in order to have different periods. After we start all 5 pendulums together, they quickly fall out of sync, because of their different periods of oscillation, and soon they start to form visual traveling waves, standing waves and quasi chaos. 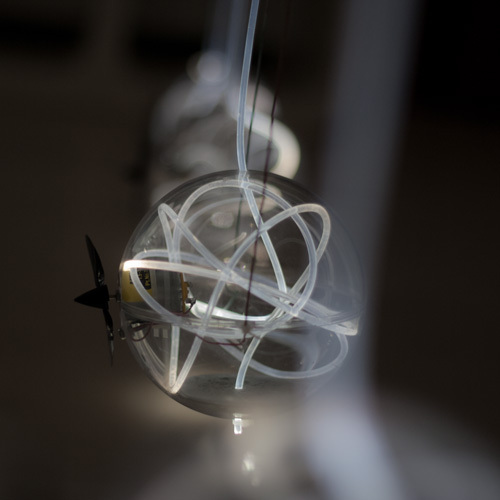 The installation is using the fundamental frequency (resonant frequency) of each pendulum in order to oscillate it. If T is the period of the pendulum, the motor is activated every T seconds for ½T of time. Graphical representation of five sinusoidal waves with increased periods as they fall “out of sync” and then they meet again in the same point to start over. 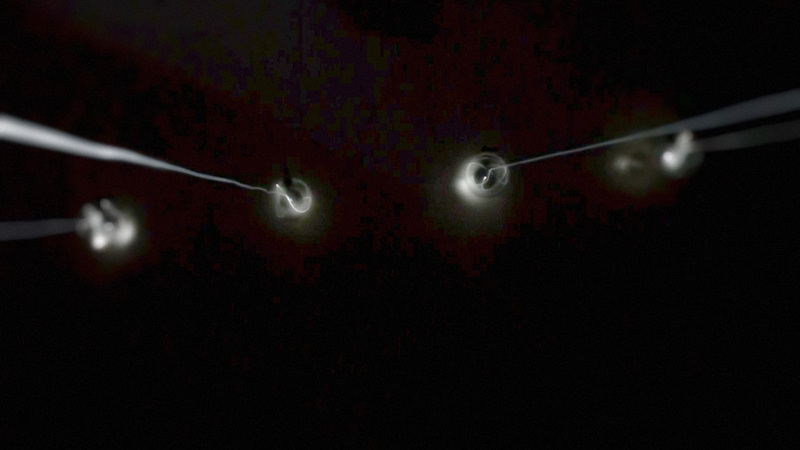 Concept animation of the five pendulums demonstrating the visual traveling waves, standing waves, beating and quasi chaos that they form across time. • The harmonic oscillation of the pendulums. • The combining motion and the patterns that the five pendulums are producing. • The sound tones are a simple sinusoidal tone. • Various properties of light like maximum and minimum luminosity or fade out speed are following a sinusoidal form. • The pentatonic scale is considering a very natural and harmonic scale. It consists of five overtones and is derived directly from the natural physical phenomenon of the harmonic series. To maximize this effect, Pentatono, is using the Pythagorean tuning and not the equal temperament notes. When a pendulum passes from the equilibrium position (the middle of the motion path) it produces a tone. These tones are simple sinusoidal waves. All together they form a pentatonic scale with the following notes. The 1st pendulum is playing an A3 (and randomly the same note an octave higher and lower) A2 and A4. In the same manner the 2nd pendulum is playing B2, B3, B4, the 3rd C#2, C#3,C#4, the 4th E2, E3, E4 and the 5th F#2, F#3, F#4. Note: We are using the Pythagorean tuning and not the equal temperament notes. 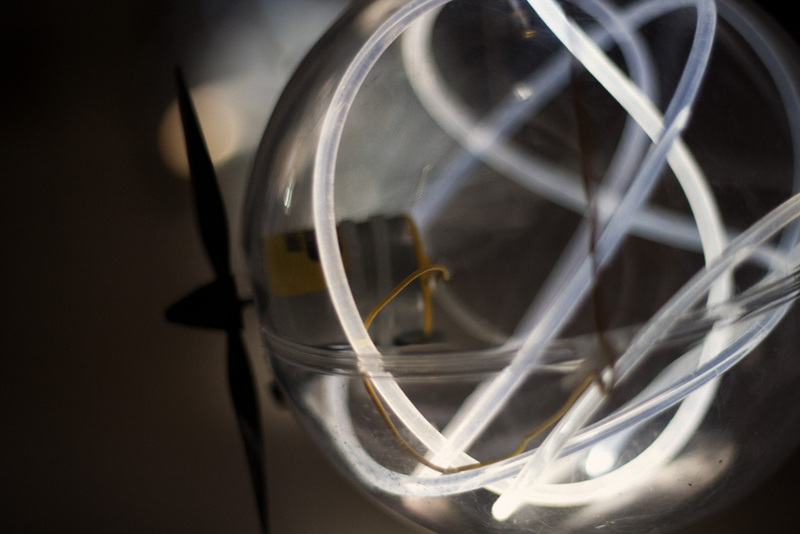 The main parts of the installation are optical fibres, leds, dc motors and acrylic spheres. Everything is controlled using an Arduino microcontroller. 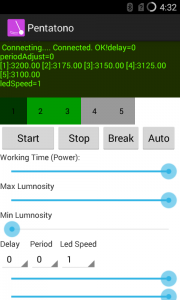 A custom android app installed on a phone is communicating via bluetooth with the Arduino and plays the sounds. The phone is also used to control various parameters of the installation (the power of the motors, the led luminosity e.c.t) . to play the sounds and control the installation. 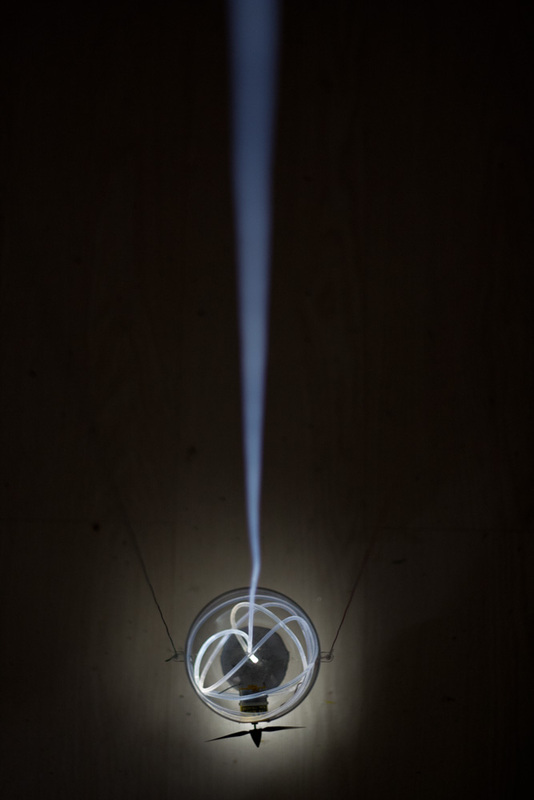 A major inspiration to this work was the “Simple Harmonic Motion” series of projects by Memo Akten.